It has been suggested that Immigrant health in Australia be merged into this article. (Discuss) Proposed since March 2019. The first migration of humans to the continent took place around 65,000 years ago via the islands of Maritime Southeast Asia and Papua New Guinea as part of the early history of human migration out of Africa. European migration to Australia began with the British convict settlement of Sydney Cove on 26 January 1788. The First Fleet comprised 11 ships carrying 775 convicts and 645 officials, members of the crew, marines, and their families and children. The settlers consisted of petty criminals, second-rate soldiers and a crew of sailors. There were few with skills needed to start a self-sufficient settlement, such as farmers and builders, and the colony experienced hunger and hardships. Male settlers far outnumbered female settlers. The Second Fleet arrived in 1790 bringing more convicts. The conditions of the transportation was described as horrific and worse than slave transports. Of the 1,026 convicts who embarked, 267 (256 men and 11 women) died during the voyage (26%); a further 486 were sick when they arrived of which 124 died soon after. The fleet was more of a drain on the struggling settlement than of any benefit. Conditions on the Third Fleet, which followed on the heels of the Second Fleet in 1791, were a bit better. The fleet comprised 11 ships. Of the more than 2000 convicts brought onto the ships, 173 male convicts and 9 female convicts died during the voyage. Other transport fleets bringing further convicts as well as freemen to the colony would follow. 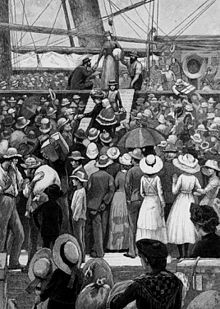 By the end of the penal transportation in 1868, approximately 165,000 people had entered Australia as convicts. The colonies promoted migration by a variety of schemes. 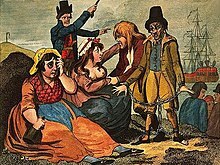 The Bounty Immigration Scheme (1835-1841) boosted emigration from the United Kingdom to New South Wales. The South Australia Company was established to encourage settlement in South Australia by labourers and skilled migrants. 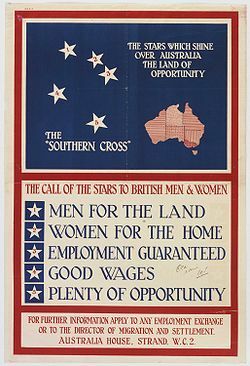 Australian Government poster issued by the Overseas Settlement Office to attract immigrants (1928). The Gold rush era, beginning in 1851, led to an enormous expansion in population, including large numbers of British and Irish settlers, followed by smaller numbers of Germans and other Europeans, and Chinese. This latter group were subject to increasing restrictions and discrimination, making it impossible for many to remain in the country. With the Federation of the Australian colonies into a single nation, one of the first acts of the new Commonwealth Government was the Immigration Restriction Act 1901, otherwise known as the White Australia policy, which was a strengthening and unification of disparate colonial policies designed to restrict non-White settlement. Because of opposition from the British government, an explicit racial policy was avoided in the legislation, with the control mechanism being a dictation test in a European language selected by the immigration officer. This was selected to be one the immigrant did not know; the last time an immigrant passed a test was in 1909. Perhaps the most celebrated case was Egon Erwin Kisch, a left-wing Czechoslovakian journalist, who could speak five languages, who was failed in a test in Scottish Gaelic, and deported as illiterate. The government also found that if it wanted immigrants it had to subsidise migration. The great distance from Europe made Australia a more expensive and less attractive destination than Canada and the United States. The number of immigrants needed during different stages of the economic cycle could be controlled by varying the subsidy. Before federation in 1901, assisted migrants received passage assistance from colonial government funds. The British government paid for the passage of convicts, paupers, the military and civil servants. Few immigrants received colonial government assistance before 1831. 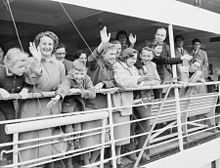 With the onset of the Great Depression, the Governor-General proclaimed the cessation of immigration until further notice, and the next group to arrive were 5000 Jewish refuge families from Germany in 1938. Approved groups such as these were assured of entry by being issued with a Certificate of Exemption from the Dictation Test. 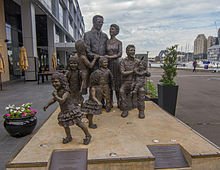 In 1954 the 50,000th Dutch migrant arrived in Australia. After World War II Australia launched a massive immigration program, believing that having narrowly avoided a Japanese invasion, Australia must "populate or perish". Hundreds of thousands of displaced Europeans migrated to Australia and over 1,000,000 British subjects immigrated under the Assisted Passage Migration Scheme, colloquially becoming known as Ten Pound Poms. The scheme initially targeted citizens of all Commonwealth countries; after the war it gradually extended to other countries such as the Netherlands and Italy. The qualifications were straightforward: migrants needed to be in sound health and under the age of 45 years. There were initially no skill restrictions, although under the White Australia Policy, people from mixed-race backgrounds found it very difficult to take advantage of the scheme. In the 1970s, multiculturalism largely displaced cultural selectivity in immigration policy. Skilled Occupation visas - Australian working visas are most commonly granted to highly skilled workers. Candidates are assessed against a points-based system, with points allocated for certain standards of education. These visas are often sponsored by individual States, which recruit workers according to specific needs. Visas may also be granted to applicants sponsored by an Australian business. The most popular form of sponsored working visa was the 457 visa set in place in 1996 which has now been abolished by the Turnbull government. Student visas - The Australian Government actively encourages foreign students to study in Australia. There are a number of categories of student visa, most of which require a confirmed offer from an educational institution. Family visas - Visas are often granted on the basis of family ties in Australia. There are a number of different types of Australian family visas, including Contributory Parent visas and Spouse visas. Employment and family visas can often lead to Australian citizenship; however, this requires the applicant to have lived in Australia for at least four years with at least one year as a permanent resident. Claims have been made that Australia's migration program is in conflict with anti age-discrimination legislation and there have been calls to remove or amend the age limit of 50 for general skilled migrants. The cap for visas granted under the humanitarian program was 13,750 for 2015-16, plus an additional 12,000 visas available for refugees from the conflicts in Syria and Iraq. The Adult Migrant English Program, available to eligible migrants from the humanitarian, family and skilled-visa streams, provides free English-language courses for those who do not have functional English. Up to 510 hours of English language courses are provided during the first five years of settlement in Australia. The Department of Home Affairs operates a 24-hour, seven-days-a-week telephone-based interpreting service called the Translating and Interpreting Service National, which facilitates contact between non-English speakers and interpreters, enabling access to government and community services. The Settlement Grants Program provides funding to assist humanitarian entrants and migrants settle in Australia and to participate equitably in Australian society as soon as possible after arrival. The program is targeted[by whom?] to deliver settlement services to humanitarian entrants, family migrants with low levels of English proficiency and dependants of skilled migrants in rural and regional areas with low English-proficiency. The Australian Cultural Orientation program provides practical advice and the opportunity to ask questions about travel to and life in Australia to refugee and humanitarian visa holders who are preparing to settle in Australia. The program is delivered overseas over five days before the visa holder begins his or her journey. Refugee and humanitarian visa holders are also eligible to receive on-arrival settlement support through the Humanitarian Settlement Services program, which provides intensive settlement-support and equips individuals with the skills and knowledge to independently access services beyond the initial settlement period. The Immigration Advice and Application Assistance Scheme provides professional assistance, free of charge, to disadvantaged visa-applicants, to help with the completion and submission of visa applications, liaison with the department,[which?] and advice on complex immigration matters. It also provides migration advice to prospective visa-applicants and sponsors. In response to the needs of asylum seekers, the Asylum Seeker Assistance Scheme was established[by whom?] in 1992 to address Australia's obligations under the Convention relating to the Status of Refugees. The Australian Red Cross administers the scheme under contract to the Department of Immigration and Citizenship. It provides financial assistance to asylum seekers in the community who satisfy specific eligibility criteria, and also facilitates access to casework assistance and to other support services for asylum seekers through the Australian Red Cross. A variety of community-based services cater to the needs of newly-arrived migrants, refugees, and asylum seekers. Some of these services, such as Migrant Resource Centres, receive funding from the Commonwealth Government. In 2016, 28.7% of the Australian resident population, or 6,912,100 people, were born overseas. New South Wales has the largest population, and the largest foreign born population, in Australia (1,544,023). Certain nationalities are highly concentrated in this state: 74.5% of Lebanese-born, 63.1% of Iraqi-born, 63.0% of South Korean-born, 59.4% of Fijian-born and 59.4% of Chinese-born Australian residents live in New South Wales. Victoria, the second most populous state, also has the second largest number of overseas-born persons (1,161,984). 50.6% of Sri Lankan-born, 50.1% of Turkish-born, 49.4% of Greek-born and 41.6% of Italian-born Australian residents live in Victoria. Western Australia, with 528,827 overseas-born residents has the highest proportion of its population being foreign-born. The state attracts 29.6% of all Singapore-born Australian residents, and is narrowly behind New South Wales in having the largest population of British-born Australian residents. Queensland had 695,525 overseas-born residents, and attracted the greatest proportion of persons born in Papua New Guinea (52.4%) and New Zealand (38.2%). There is a range of views in the Australian community on the composition and level of immigration, and on the possible effects of varying the level of immigration and population growth. In 2002, a CSIRO population study commissioned by the former Department of Immigration and Multicultural Affairs, outlined six potential dilemmas associated with immigration-driven population growth. These included: the absolute numbers of aged continuing to rise despite high immigration off-setting ageing and declining birth-rates in a proportional sense; a worsening of Australia's trade balance due to more imports and higher consumption of domestic production; increased greenhouse gas emissions; overuse of agricultural soils; marine fisheries and domestic supplies of oil and gas; and a decline in urban air quality, river quality and biodiversity. Some environmental movements believe that as the driest inhabited continent, Australia cannot continue to sustain its current rate of population growth without becoming overpopulated. The Sustainable Population Australia (SPA) argues that climate change will lead to a deterioration of natural ecosystems through increased temperatures, extreme weather events and less rainfall in the southern part of the continent, thus reducing its capacity to sustain a large population even further. The Australia Institute has concluded that Australia’s population growth has been one of the main factors driving growth in domestic greenhouse gas emissions. It concluded that the average emissions per capita in the countries that immigrants come from is only 42 percent of average emissions in Australia, finding that as immigrants alter their lifestyle to that of Australians, they increase global greenhouse gas emissions. The Institute calculated that each additional 70,000 immigrants will lead to additional emissions of 20 million tonnes of greenhouse gases by the end of the Kyoto target period (2012) and 30 million tonnes by 2020. A number of economists, such as Macquarie Bank analyst Rory Robertson, assert that high immigration and the propensity of new arrivals to cluster in the capital cities is exacerbating the nation's housing affordability problem. According to Robertson, Federal Government policies that fuel demand for housing, such as the currently high levels of immigration, as well as capital gains tax discounts and subsidies to boost fertility, have had a greater impact on housing affordability than land release on urban fringes. The Productivity Commission in its 2004 Inquiry Report No. 28, First Home Ownership, concluded: "Growth in immigration since the mid-1990s has been an important contributor to underlying demand, particularly in Sydney and Melbourne." The Reserve Bank of Australia in its submission to the same Productivity Commission report stated that "rapid growth in overseas visitors such as students may have boosted demand for rental housing". However, the Commission found that "the ABS resident population estimates have limitations when used for assessing housing demand. Given the significant influx of foreigners coming to work or study in Australia in recent years, it seems highly likely that short-stay visitor movements may have added to the demand for housing. However, the Commissions are unaware of any research that quantifies the effects." Some individuals and interest groups have also argued that immigration causes overburdened infrastructure. Australia maintains a list of skilled occupations that are currently acceptable for immigration to Australia. In 2009, following the global financial crisis, the Australian government reduced its immigration target by 14%, and the permanent migration program for skilled migrants was reduced to 115,000 people for that financial year. In 2010-2011, the migration intake was adjusted so that 67.5% of the permanent migration program would be for skilled migrants, and 113,725 visas were granted. According to Graduate Careers Australia, there have been some declines in full-time employment between 2012–2015 for recent university graduates of various degrees, including dentistry, computer science, architecture, psychology, and nursing. In 2014, a number of the professional associations for some of these fields criticised the immigration policy for skilled migrants, contending that these policies have contributed to difficulties for local degree holders in obtaining full-time employment. In 2016, the Department of Health forecast a shortfall in nurses of approximately 85,000 by 2025 and 123,000 by 2030. In 2016, Monash University academics published a report which contended that Australia's immigration program is deeply flawed. The government's Medium to Long-Term Strategic Skill List allows immigration by professionals who end up competing with graduates of Australian universities for scarce positions. On the other hand, Australia's shortage of skilled tradespeople is not being addressed. Another element in the immigration debate is a concern to alleviate adverse impacts arising from Australia's aging population. The former Federal Treasurer, Peter Costello has said that Australia is underpopulated due to a low birth rate, and that negative population growth will have adverse long-term effects on the economy as the population ages and the labour market becomes less competitive. To avoid this outcome the government increased immigration to fill gaps in labour markets and introduced a subsidy to encourage families to have more children. However, opponents of population growth such as Sustainable Population Australia do not accept that population growth will decline and reverse, based on current immigration and fertility projections. There is debate over whether immigration can slow the ageing of Australia's population. In a research paper entitled Population Futures for Australia: the Policy Alternatives, Peter McDonald claims that "it is demographic nonsense to believe that immigration can help to keep our population young." However, according to Creedy and Alvarado (p. 99), by 2031 there will be a 1.1 per cent fall in the proportion of the population aged over 65 if net migration rate is 80,000 per year. If net migration rate is 170,000 per year, the proportion of the population aged over 65 would reduce by 3.1 per cent. As of 2007 during the leadership of John Howard, the net migration rate was 160,000 per year. According to the Commonwealth Treasury, immigration can reduce the average age of the Australian population: "The level of net overseas migration is important: net inflows of migrants to Australia reduce the rate of population ageing because migrants are younger on average than the resident population. Currently, around 85 per cent of migrants are aged under 40 when they migrate to Australia, compared to around 55 per cent for the resident population." Ross Gittins, an economics columnist at Fairfax Media, has said that the Government's focus on skilled migration has in fact reduced the average age of migrants. "More than half are aged 15 to 34, compared with 28 per cent of our population. Only 2 per cent of permanent immigrants are 65 or older, compared with 13 per cent of our population." Because of these statistics, Gittens claims that immigration is slowing the ageing of the Australian population and that the "net benefit to the economy is a lot more clear-cut." Robert Birrell, director of the Centre for Population and Urban Research at Monash University, has argued: "It is true that a net migration intake averaging around 180,000 per year will mean that the proportion of persons aged 65 plus to the total population will be a few percentage points lower in 2050 than it would be with a low migration intake. But this ‘gain’ would be bought at the expense of having to accommodate a much larger population. These people too, will age, thus requiring an even larger migration intake in subsequent years to look after them." In July 2005 the Productivity Commission launched a commissioned study entitled Economic Impacts of Migration and Population Growth, and released an initial position paper on 17 January 2006 which states that the increase of income per capita provided by higher migration (50 percent more than the base model) by the 2024–2025 financial year would be $335 (0.6%), an amount described as "very small." The paper also found that Australians would on average work 1.3 percent longer hours, about twice the proportional increase in income. Using regression analysis, Addison and Worswick found in a 2002 study that "there is no evidence that immigration has negatively impacted on the wages of young or low-skilled natives." Furthermore, Addison's study found that immigration did not increase unemployment among native workers. Rather, immigration decreased unemployment. However, in 2005 the Productivity Commission concluded that higher immigration levels would result in lower wage growth for existing Australian residents. On the impact of immigration on unemployment levels, the Commission said: "The conclusion that immigration has not caused unemployment at an aggregate level does not imply that it cannot lead to higher unemployment for specific groups. Immigration could worsen the labour market outcomes of people who work in sectors of the economy that have high concentrations of immigrant workers." Gittins claims there is considerable opposition to immigration in Australia by "battlers" because of the belief that immigrants will steal jobs. Gittins claims though that "it's true that immigrants add to the supply of labour. But it's equally true that, by consuming and bringing families who consume, they also add to the demand for labour – usually by more." Overall, Gittins has written that the "economic case for rapid population growth though immigration is surprisingly weak," noting the diseconomies of scale, infrastructure costs and negative environmental impacts associated with continued immigration-driven population growth. Robert Birrell has asserted that high immigration levels are being used by the Federal Government to stimulate aggregate economic growth, but that per capita growth is more important to Australians. Birrell concluded that high migration does not benefit existing residents, because it dilutes the benefit that can accrue from the export of non-renewable resources which form a large part of the Australian economy. As well, Birrell argues that a slowdown in labour force growth would require employers to pay greater attention to training, wages and conditions of workers. Robert Birrell has argued that immigration is creating social divisions and risks long-term national unity. Anthropologist and ethologist Frank Salter has argued that immigration is creating "ethnic stratification" in Australian society. Over the last decade, leaders of the major Federal political parties have demonstrated support for high level immigration (including John Howard, Peter Costello and Kim Beazley). There was, overall, an upward trend in the number of immigrants to Australia over the period of the Howard Government (1996–2007). The Rudd Labor Government (elected 2007) increased the quota again once in office. In 2010, both major parties continue to support high immigration, with former Prime Minister Kevin Rudd advocating a 'Big Australia'; and Opposition Leader Tony Abbott stating in a 2010 Australia Day speech that: "My instinct is to extend to as many people as possible the freedom and benefits of life in Australia". In 2003, economist Ross Gittins, a columnist at Fairfax Media, said former Prime Minister John Howard had been "a tricky chap " on immigration, by appearing "tough" on illegal immigration to win support from the working class, while simultaneously winning support from employers with high legal immigration. In 2006, the Labor Party under Kim Beazley took a stance against the importation of increasingly large numbers of temporary skilled migrant workers by employers, arguing that this is simply a way for employers to drive down wages. Anti-immigration policies are a major part of One Nation Party policies, formed by Pauline Hanson in the late 1990s. Australia's policies concerning refugees and asylum have been the subject of much debate. ^ Smith, Debra (9 May 2007). "Out of Africa – Aboriginal origins uncovered". The Sydney Morning Herald. Retrieved 5 June 2008. Aboriginal Australians are descended from the same small group of people who left Africa about 70,000 years ago and colonised the rest of the world, a large genetic study shows. After arriving in Australia and New Guinea about 50,000 years ago, the settlers evolved in relative isolation, developing unique genetic characteristics and technology. ^ Markus, Andrew. "Attitudes to immigration and cultural diversity in Australia." Journal of Sociology 50.1 (2014): 10-22. ^ "Australia's population will hit 25m today". www.9news.com.au. Retrieved 8 August 2018. ^ "Australia's population hits 25 million, 33 years ahead of schedule - MacroBusiness". www.macrobusiness.com.au. Retrieved 8 August 2018. ^ "'We have a right to a say': Hanson continues population plebiscite push". Retrieved 8 August 2018. ^ "Pauline Hanson: Give Australians a vote on immigration - MacroBusiness". www.macrobusiness.com.au. Retrieved 8 August 2018. ^ A story of rupture and resilience: When did Australia's human history begin? ABC News, 17 November 2017, Retrieved 17 November 2017. ^ "Ten Pound Poms". Museum Victoria. 10 May 2009. ^ Australian Government. Department of Home Affairs. "Visa listing". Retrieved 23 January 2018. ^ Australian Visa Bureau (22 December 2011). "Australia visas". Retrieved 22 December 2011. ^ "Offshore - Resettlement". www.border.gov.au. Retrieved 2 January 2017. ^ "The Special Humanitarian Programme (SHP)". www.border.gov.au. Retrieved 2 January 2017. ^ "Australia's response to the Syrian and Iraqi humanitarian crisis". www.border.gov.au. Retrieved 2 January 2017. 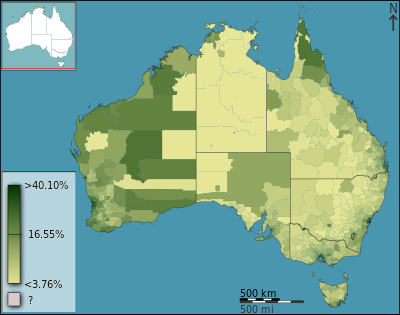 ^ "2006 Census Data : View by Location Or Topic". Censusdata.abs.gov.au. Retrieved 14 July 2011. ^ Foran, B., and F. Poldy, (2002), Future Dilemmas: Options to 2050 for Australia's population, Technology, Resources and Environment, CSIRO Resource Futures, Canberra. ^ "Baby Bonus Bad for Environment" (PDF). population.org.au. Sustainable Population Australia. Archived from the original (PDF) on 27 June 2008. Retrieved 20 May 2015. 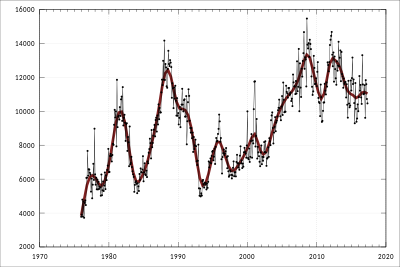 ^ a b "Population Growth and Greenhouse Gas Emissions". Tai.org.au. 10 July 2011. Retrieved 14 July 2011. ^ "High Population Policy Will Double Greenhouse Gas Growth". Tai.org.au. 10 July 2011. Retrieved 14 July 2011. ^ a b c "Microsoft Word - prelims.doc" (PDF). Archived from the original (PDF) on 3 June 2011. Retrieved 14 July 2011. ^ "Skilled Occupations List (SOL)". www.border.gov.au. Retrieved 2 January 2017. ^ "Immigration cut only temporary 16Mar 2009". Abc.net.au. 16 March 2009. Retrieved 14 July 2011. ^ Patty, Anna (8 January 2017). "Forecast oversupply of doctors to hit this year amid calls to halt imports". The Sydney Morning Herald. Retrieved 8 January 2017. ^ "Costello hatches census-time challenge: procreate and cherish". The Sydney Morning Herald. 25 July 2006. ^ "Population Ageing, Migration and Social Expenditure". Amazon.com. 9 September 2009. Retrieved 14 July 2011. ^ "Farewell, John. We will never forget you". The Age. Melbourne. 25 November 2007. ^ "Part 2: Long-term demographic and economic projections". Treasury.gov.au. Archived from the original on 2 June 2011. Retrieved 14 July 2011. ^ a b "Back-scratching at a national level". The Sydney Morning Herald. 13 June 2007. ^ Addison, T. and Worswick, C. (2002). The impact of immigration on the earnings of natives: Evidence from Australian micro data. , Vol. 78, pp. 68–78. ^ Salter, F. The Misguided Advocates of Open Borders, Quadrant, Volume LIV Number 6, June 2010. ^ "Lateline – 11/06/2008: Immigration intake to rise to 300,000". Abc.net.au. Retrieved 14 July 2011. ^ Hudson, Phillip (23 January 2010). "Abbott urges more migration, compassion for boat people". The Advertiser. This page was last edited on 21 April 2019, at 05:26 (UTC).